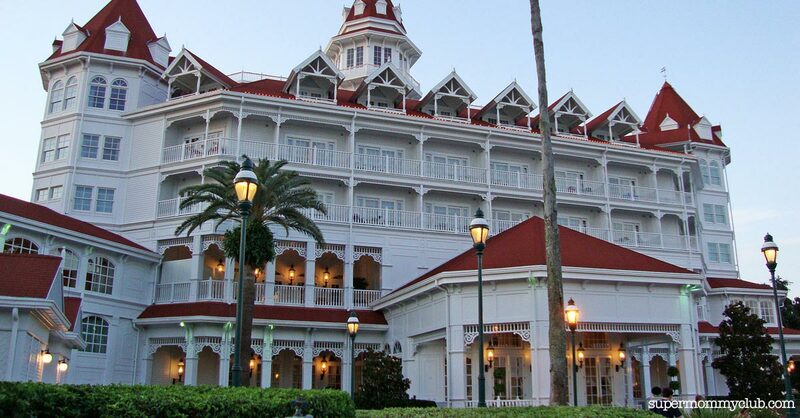 Are Disney World hotels really worth the money - or an unnecessary expense? Home > Disney Hacks > Are Disney World Hotels Really Worth the Money – Or Just An Unnecessary Expense? Are Disney World Hotels Really Worth the Money – Or Just An Unnecessary Expense? One of the questions I’m asked by friends when they’re thinking of going to Disney World on vacation is whether they should actually stay in a Disney World hotel or not. Useful I know, but seriously there are a number of factors that need to be taken into account before you can decide on the best place for you to stay while you’re in Orlando. The main factor that determines where you can rest your weary head at night is the size of your budget. You won’t be surprised to read the Disney World hotels don’t come cheap; you have to pay a premium to stay cocooned in that Disney Bubble for the whole of your stay. Of course, this is Disney, so you do get a lot of bang for your buck. Let’s take a look at the pros and cons to help you make a decision about whether you should stay in a Disney hotel or not. When the Imagineers built the Disney World Resort they didn’t put the magic just in the theme parks, you’ll soon discover that each Resort hotel is an experience in itself. Whether you want to be whisked off to a Polynesian Isle at the Polynesian Resort, experience the grandeur of Victorian Florida at the Grand Floridian Resort & Spa or watch animals roaming the savannahs at the Animal Kingdom Lodge, no two hotels are the same, and they are unlike any hotel you’ll stay in anywhere else in the world. As a Disney World guest you have access to the free Disney Transportation System to travel between the various hotels, themeparks, golf courses, water parks and the shopping village. 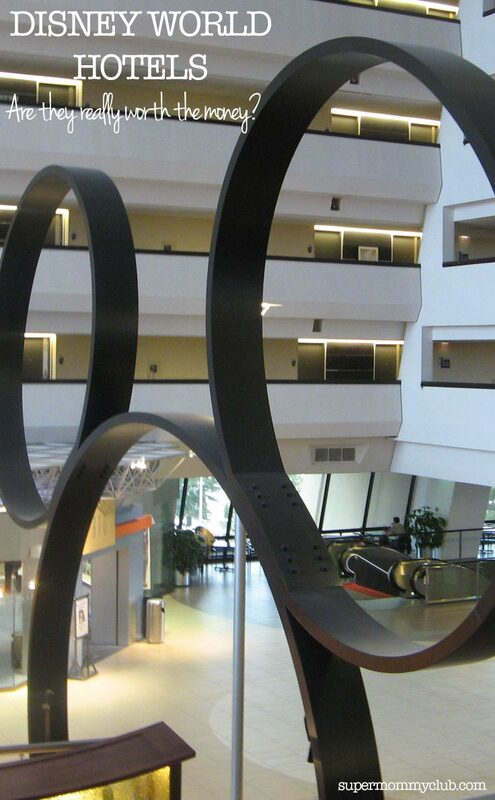 Depending on your Resort hotel of choice you’ll have access to busses, boats and even the monorail system. You don’t even need to worry about renting a car if you’re flying in for your vacation. Disney’s free Magical Express coach service will collect you and your luggage from the airport and transfer you to your Resort. Then when your vacation is over they’ll take you back again in time for your flight. Resort guests are able to take advantage of Disney World’s Extra Magic Hours programme, which means on select days you can enter the parks one hour before the official opening, or stay for two or three hours after official closing. If you are travelling during off-peak season when the park opening hours are shorter this perk will allow you more time to experience your favourite attractions. If you are travelling at a particularly busy time such as Christmas or Thanksgiving then you may find the parks reach capacity early in the day. When this happens Day Guests (i.e. those not staying in a Disney hotel) are turned away at the gate to ensure there is still room for Hotel guests. So if you’re planning a Christmas visit you’ll want to find a Disney Resort to stay in. If you are travelling with teenagers then staying on site will allow you to give them a little bit of freedom. Because the hotels are linked to the parks by the transportation system you don’t need to spend all of your time together as a family. The kids will be able to come and go as they please without relying on you and the car to ferry them around like they do back home. If you’re taking young family to Disney World then you might not like the idea of missing out on the evening entertainment because the kids need to sleep. If you stay in a Disney World Resort hotel then you’ll have access to the in-room babysitting service (for an additional cost). If your children are of school age there are also some brilliant kid’s clubs. Touring the parks can be tiring, especially in the heat of the summer months. Staying in a Disney World hotel makes it really easy to leave the parks during the afternoon and return back to your room for a nap. You can also take advantage of the Resort pool to cool off and refresh before heading back out to the parks in the evening. 8. They don’t lock the gates! I have been asked this question by a few readers now so I thought it would be best to answer it here. Yes! Of course you can. I promise that they do not lock the gates and trap you inside. Of course unless you want to pay for a cab you will need a car so that you can explore the local area. Whether that’s a trip to Universal Studios or Sea World, shopping at the Premium Outlet Mall or just going out to dinner at one of the many restaurants on Highway 192. There are some downsides you need to consider when making your decision. There’s no two ways about it – even if you stay at a Value Resort you will pay for the privileges mentioned above in the price of your room. If money is tight then you might want to consider looking outside the gates of the Disney World Resort where you can find cheaper accommodation (though it won’t be to the same standard of course). Free transport is definitely an advantage, but if it encourages to go car-less then it can become a disadvantage. With the exception of the Magic Kingdom I firmly believe you can travel between resorts and parks more quickly by car. Besides who wants to wait in line and stand on a bus full of sweaty people at the end of the day – you’re supposed to be on vacation right? Having a car will also allow you to visit local supermarkets, malls and other (non-Disney) theme parks more easily. You will find some world class restaurants in the Walt Disney World Resort and plenty of choice; it’s certainly not all hot dogs and fries. But if you’re on a budget, or travelling with fussy eaters, then you might be better off eating at one of the many chain restaurants you will find outside the gates in nearby Kissimmee, Lake Buena Vista or in the International Drive area. What are the lodging options outside of the Disney World Resort? Lodging options in the surrounding areas can vary greatly, from cheap and cheerful motels to private rentals and luxurious hotels. Popular with tourists, this area is about 15 to 25 minutes northeast of Disney World and is well placed if you wish to spend time at Universal Studios or SeaWorld. Personally I’m not a fan of this area and the traffic on International Drive can be awful at times but some people swear by the hotels here. There are a number of hotels and affordable suites to choose from on the FL 535 and west of the I-4. Within easy reach of Disney World and many restaurants this would be my second choice for off property vacations. My personal favourite is the Kissimmee area along the US192 West. You’ll find countless hotels and affordable private rentals – many with private pools. And with access to Disney World property via the ‘secret’ Sherberth Road shortcut you can actually reach some of the parks more quickly than if you were a Resort guest! 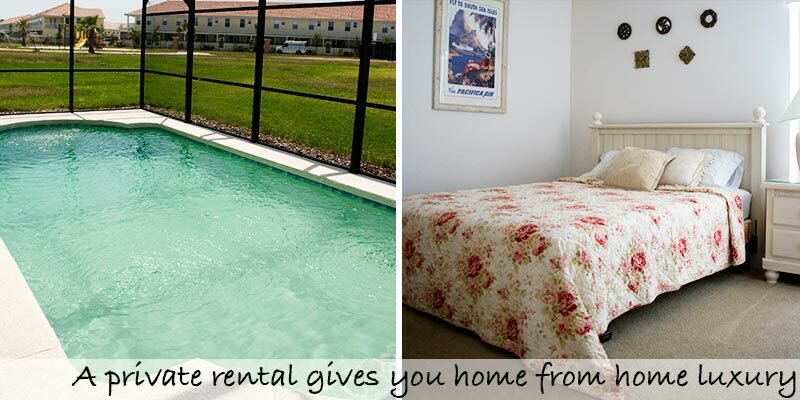 What are the advantages of the vacation rentals near Disney World? Staying outside of the World makes it much easier to visit other local attractions. There is life outside Disney World and you can choose your location depending upon the other attractions you want to visit on your trip – such as Sea World, Universal Studios Florida, or the shopping malls! There are lots of “chain” restaurants available to help you keep the costs down if you’re travelling on a budget. If you are travelling as a family then you may want to consider a private rental home; why cram yourselves into a hotel room when for a similar price you can rent a whole house? You need to be at the parks before opening to avoid the lines, so you don’t want to waste valuable time eating breakfast in a restaurant. Choose a private rental (villa) or a hotel suite with kitchen facilities and you can fix yourself breakfast instead. Most private rental homes come with private pools, so there’s no fighting over the sun loungers. What are the downsides of the vacation rentals near Disney World? I don’t really see this as a disadvantage but some people can’t/don’t like to drive on vacation. Of course you can get a coach or town car transfer from the airport, and many hotels do shuttle buses to Disney and the other parks but you’ll be pretty limited without your own transport. You’ll miss out on things like Extra Magic Hours and Guaranteed Admission. When relying on a car it’s less easy to split up during the day, and you won’t be able to let your teenagers visit the parks alone unless you’re willing to drop them off and pick them up again. The extra magic you’ll experience by staying in a Disney Resort just can’t be found anywhere else! If you are planning a trip and you are looking for a private villa with a pool then you should know that my favourite home away from home is this 4-bed private rental in Cumbrian Lakes, Kissimmee. We stayed there for three weeks in May 2007 and loved it; I’ve stayed in a lot of villas over the years and this one put all of the others to shame – if we weren’t DVC members now I’d want to stay there every trip! Should you stay in a Disney World Resort hotel or not? I really can’t answer that question for you because it’s all down to personal preference, party size and budget. When we were kids we always stayed in a private rental when we were on vacation at Disney World. We loved the space and the convenience of the kitchen and private pool, and houses in Kissimmee are so close to the parks that you can get from the house to the parking lot in less than 30 minutes. I am a huge fan of private rentals. 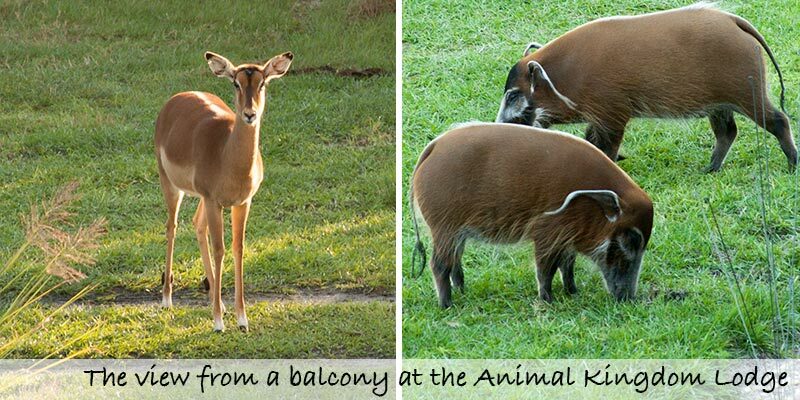 When my husband and I first visited Disney World together we stayed in the Ramada Maingate on Highway 192 and couldn’t fault it; take a shortcut up Sherberth road and we were at the Animal Kingdom in just five minutes. We didn’t experience Disney World Resort hotels until our honeymoon when we stayed at the Animal Kingdom Lodge for a week, and we just fell in love with the Disney magic. Since then we invested in the Disney Vacation Club (timeshare) programme which gives us the best of both worlds. We get to stay in a Disney hotel but we have a studio with kitchen facilities, and we still hire a car so while we can use the free Disney transport when we feel like it we can also hop in the car to go shopping or to eat in the restaurants along Highway 192. Next PostNext How to Save on Disney World Tickets – Without Listening to BORING Timeshare Presentations!